The Colour Out of Space, text by H.P. 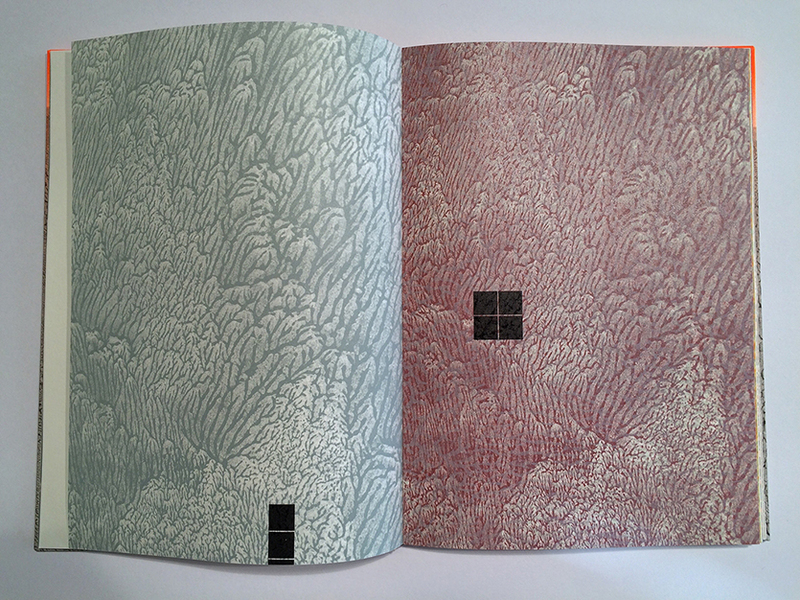 Lovecraft with images, printing, design, and binding by Amy Borezo. Covers are airbrushed with orange acrylic paint and the veined pattern is created through a paste paper technique. Suede spine. The imagery on the cover evokes the landscape and setting of the story. First of seven abstract image spreads. The text is a mix of horror and science fiction. A meteorite lands on a farm in Massachusetts near the site of a proposed reservoir, carrying with it an “invisible colour” that gradually spreads through a community like radiation poisoning. The imagery is first created through a pulled paste paper technique and is then printed from polymer plates. The pattern evokes the natural world—foliage, rocks, mud, water. A geometric pattern will emerge on top of this “natural” pattern. Text spread with printed concertina visible in gutter. Signatures are sewn into the valley folds of a concertina that has been printed with a pulled paste paper pattern in flourescent orange ink. The concertina folds are engineered to create a natural round in the spine of the book. The choice to use a concertina is not only structural, but also aesthetic and conceptual. 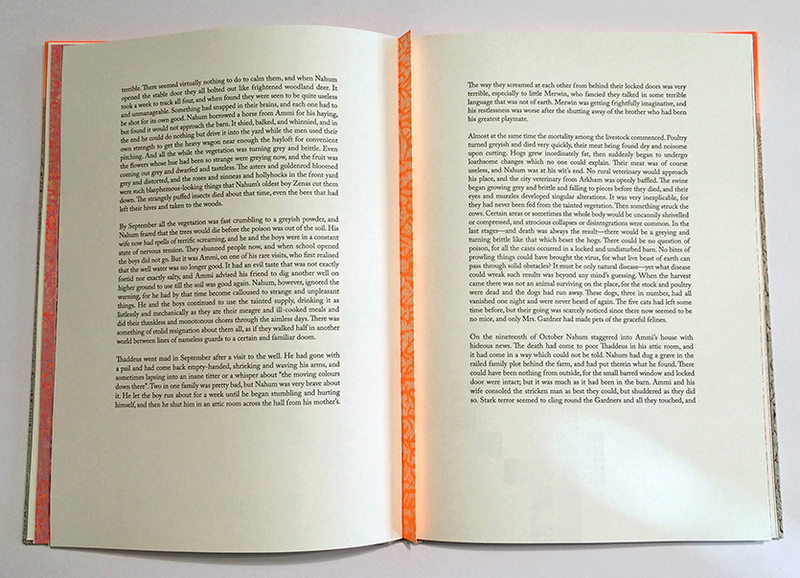 The flourescent ink from the printed concertina glows from the center of many text spreads, evoking the radioactive “colour” described in the text. 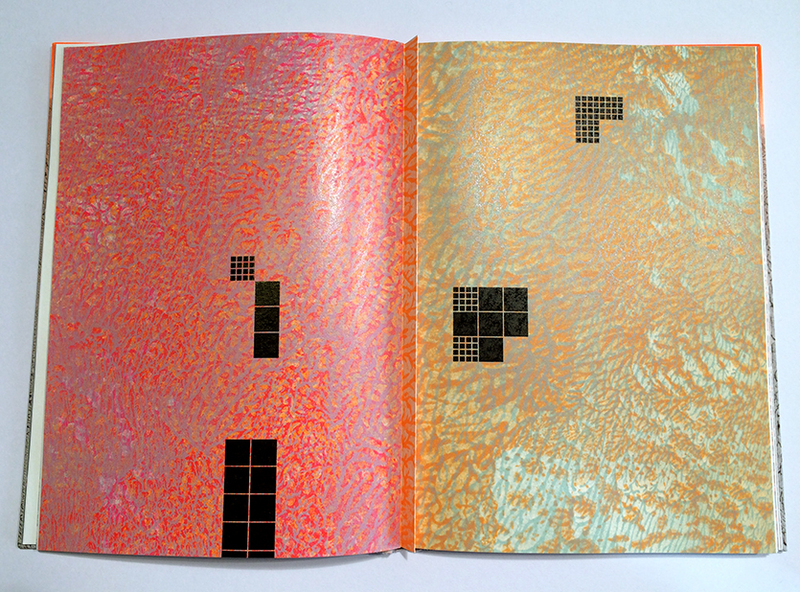 Flourescent ink is used throughout the book as it emits both visible and non-visible spectrum light, similar to the color described in the story. Here the black geometric pattern begins to grow, just as the site of the radiation begins to spread throughout the town. Patterns are layered on top of each other to create unusual, otherworldly visual effects. A pattern evoking natural forms becomes “unnatural” or strange with jarring color choices, juxtapositions, and layering. 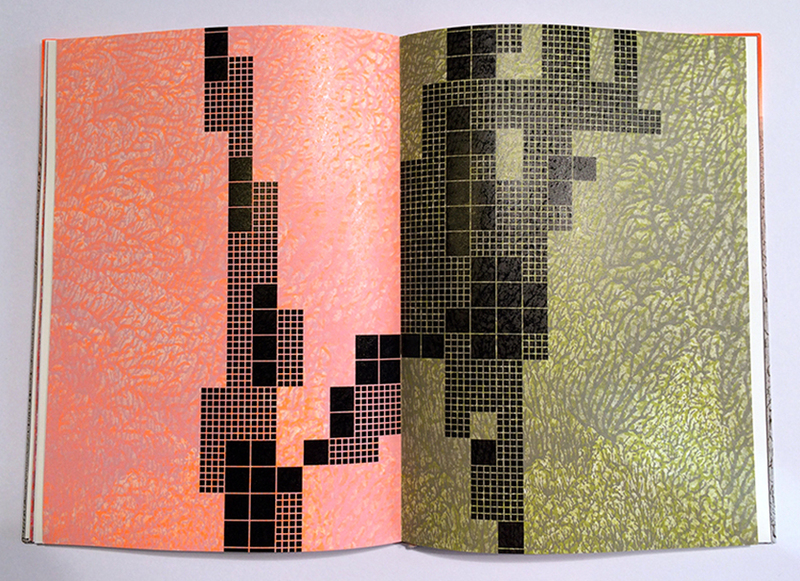 Final image spread with a large amount of the black geometric pattern. Not only does the black geometric pattern represent a spreading contamination, but it also corresponds to the shape of the Quabbin Reservoir in Massachusetts, which is the supposed setting for this fictional story. The toxicity carried and spread by the meteor can be seen as a metaphor in the text for the coming progress and industrialization as represented by the creation of the Reservoir itself. Letterpress/relief printing from photopolymer plates. Shaped concertina case binding with paste paper decorated covers. H.P. Lovecraft considered The Colour out of Space one of his best stories. In this narrative from 1927, Lovecraft blends horror and science fiction to create a dread terror of the unknown. A meteorite falls on a farm in central Massachusetts and causes devastation in the form of a mysterious, gradual toxicity of the land, vegetation, and people, often described as a strange colour. The location of the fallen meteorite is also the future site of a reservoir that will eventually be a major water supply for a large city. 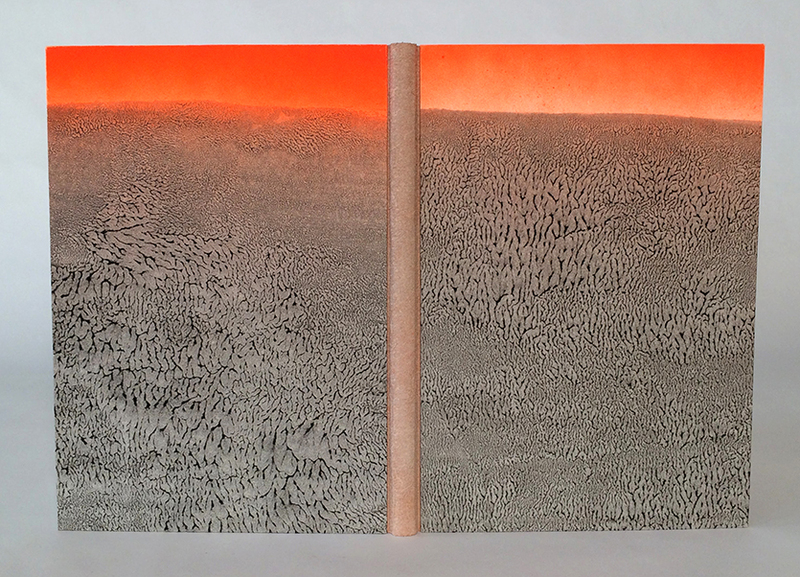 This artist’s book edition of the story includes an introduction by Lovecraft scholar S.T. Joshi and 14 color images by Amy Borezo. The artist lives near the supposed site of this fictional tale and frequently walks the old roads of the towns now underneath the Quabbin Reservoir. In creating the imagery for this work, the artist was interested in the inherent romanticism of this familiar landscape as well as Lovecraft’s own professed dislike of progress and modern industrialization. The toxicity from the meteorite at the site of the reservoir could be seen as a metaphor for the effects of modernity itself. The images reflect these ideas in abstract form.